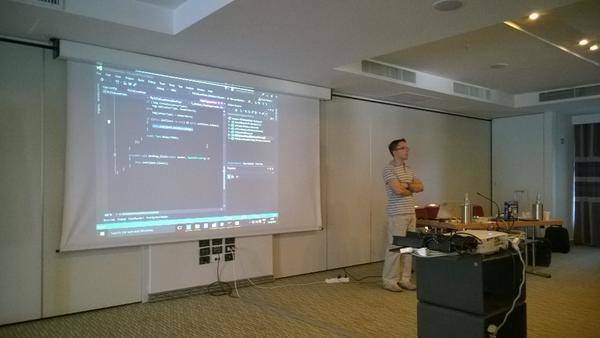 This year I was pleased to be speaker at Mobile Camp 2015 organized by Microsoft in Naples; this year the event was focused on Windows 10 and all the awesome news from Build 2015. As Microsoft MVP on Windows Embedded & IoT, my session was on Raspberry Pi 2 with Windows 10 IoT Core as embedded system and its connection to the Azure Event Hubs. The simple demo showed the Raspberry Pi 2 sent temperature data (from an I2C temperature sensor) to the Event Hubs using my Azure SB Lite library (based on AMQP protocol). You can find all the material on SlideShare (slide) and GitHub (demo source code). Developing a new library for accessing to the Microsoft Azure Service Bus (event hubs, queues, topics / subscriptions) based on AMQP (and AMQP .Net Lite library) I came across a bug in the code of the regular expression in the .Net Micro Framework. The bug occurred by chance, when I had a "connection string" in which there was the "SharedAccessSignature" field that has a value when we use the AMQP connection with CBS (Claim Based Security); for example when we publish to a "publisher" endpoint in the event hubs with a SAS-based security token. Now … I can write something !! About two weeks ago I received a great present from Secret Labs (thanks to Chris Walker) … the new Netduino 3 Wi-Fi board ! There is a new .Net Micro Framework board in town ! In the past few months, MikroElektronika release the Quail Board as a solution for building hardware prototypes using all the best features of .Net Micro Framework and the related “click” boards for a lot of type of external devices, like sensors (humidity, temperature, …), wifi module, OLED and so on. It was and it will be a very busy time for me ... and if you want to hear me talk about the Internet of Things around Italy (and the "world"), you just need to read the agenda of upcoming events ! Tomorrow, on Saturday April 18th, there will be the third edition of the Microsoft Embedded Conference in Naples that has become the Internet of Things Conference organized as always by the DotNetCampania community thanks to the sponsorship of Microsoft Italy. A year has passed since I received the first Microsoft MVP award on Windows Embedded and a few days ago (on April 1st) I received the more exciting email you might expect ... the renewal ! My "role" as MVP has allowed me to be at the summit in November in Redmond at the Microsoft headquarter and for me it was an awesome experience, knowing the team that works on IoT and all those people with whom I had only "virtual" contacts. Thanks to all those who have continued to believe in me and consider me worthy of this award. As for me I will continue with maximum effort, hoping that next year will be here again to write the same post ! Finally the new M2Mqtt 4.1 version is out ! In the last months, my library was under pressure thanks to my friends Olivier Vigliengo (from Adeneo) and Nicolas Besson (Microsoft MVP on Windows Embedded, from Adeneo). They used the MQTT client for their hobbistic projects and stressed it a lot ! After exchanging a lot of emails with log traces, I fixed some bugs and added some improvements to the library.